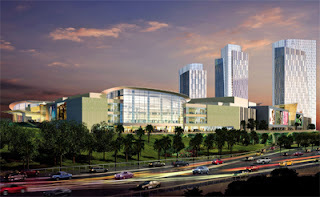 An artist’s impression of IOI City Mall. PUTRAJAYA: IOI Properties Bhd's new shopping mall, IOI City Mall, will be sealing an agreement with one anchor tenant and one key tenant next month. Construction of the mall is on track to be completed by 2014, and will feature a one-of its-kind entertainment park that has yet to be seen in any mall in the Klang Valley. “By 2014, the mall, along with two office towers will be completed. By 2015, a hotel will be added next to the mall. The mall and the office blocks will be fully leased out. We will only sell the office blocks if we get an en-bloc buyer,” said IOI Properties Bhd senior general manager, Lee Yoke Har. She added that the total gross development value for the commercial project was some RM2bil, with the mall taking up RM1bil. The mall, the office blocks and the hotel would occupy 36 acres and funding of it will come from internal funds. The mall would have a crucial differentiation point that would set it apart from other malls. While refusing to divulge details, she added that the differentiation was in its entertainment park that was targeted at teenagers and young adults. “If you like adrenaline rush coupled with information technology, then our entertainment park is for you,” said Lee. Featuring the Garden Mall concept with lots of alfresco dining, the IOI City Mall will have a net lettable area of 1.35 million sq ft, some 350 shops and 7,200 car parks. The mall will be located in IOI Resort City. “At present, construction of the three basement levels of the malls had been completed, and we are now starting to construct the above level storeys. The mall will have four storeys,” said Lee. She added that the immediate target market of the mall was the 1.1 million residents living within a 10 minute drive from the Putrajaya area. Once completed, she felt that the mall would play a big role in further stimulating the vibrancy of Putrajaya. “Actually, it was one of our tenants who suggested that we build the mall here. The southern portion of the Klang Valley is an untapped mall area. Most of them are concentrated in the northern part,” said Lee. To support the commercial activity of the mall and the office towers, IOI Properties will also be launching condominiums and semi-detached houses in IOI Resort City and 16 Sierra, in 2013. Lee said that accessibility to IOI City Mall was excellent, and they were targeting people from the KL-Seremban highway. Right now, IOI City Mall's location is five minutes off the Kajang Toll. It is connected to Kuala Lumpur via the Maju Expressway to Putrajaya. “There will be two new interchanges from the Maju Expressway in the future. One is from the Equine Park in Serdang, where construction has already started. “The other interchange, which has just received approval, is near the Malaysian Agricultural Research and Development Institute, which is diagonally opposite to us,” said Lee. Meanwhile, she added that the other exciting project in the pipeline was its IOI Vivo City commercial project in Puchong. This project, which takes up some 80 acres, will have a high emphasis on the green concept. Infrastructure construction of Phase 1 which consists of some 7 acres, will start by year-end. “We see demand for a neighbourhood mall in Puchong. A mall which is unlike the family mall of IOI Mall. The new neighbourhood mall will have a heavy focus on food and beverage with lots of niche offerings for the young adults,” she said.